Despite the relative brevity of his life, composer Kurt Weill forged a far-reaching career that challenged the purity of preexisting styles. As a famous German Jew, he fled Nazi Germany, fending for himself in foreign countries such as America, where versatility of styles, unlike anything in Germany, interested him the most. That these varied styles music and theater, American and Europeanin which he worked were (and sometimes still are) hostile to one another, places him less in the role of a unifier, and more in the role of a crossover artist. Many who unconditionally praise Weill's output typically pick only one of his musical personalities and contrive ways of dismissing whatever other body of his work might offend them (whether his German music, Broadway music, lowbrow songs or highbrow works). Critics and scholars are presented a perplexing task when called upon to classify or evaluate Weill's importance to music or theater of the 20thcentury, since their critical versatility rarely matches Weill's creative versatility. As he was sometimes outspoken, attacking with flare what he declared to be outmoded prejudices, Weill provided many quotable statements that lend support to many of his adherents, as well as his detractors. At other times he seemed to maneuver with stealth, using these very same prejudices to cleverly keep his career vital, nonchalantly but deftly pressing the political buttons of the international music world of the 1920s, 30s and 40s. He was deceptively shrewd with business, socially charming, despite his shyness, and, above all, planned everything he did with equanimity and without impetuosity. In all these ways, he was the direct opposite of his most famous collaborator, Bertolt Brecht. Born in Dessau March 2, 1900, Kurt Julian Weill was the son of a Jewish cantor. Despite his religious upbringing, he did not ostensibly practice Judaism throughout his life, although these roots came into substantial play at opportune and inopportune moments of his career. In 1918, he traveled to Berlin and studied philosophy and music, including a brief period with the opera composer Engelbert Humperdinck. A few years later, he took up lessons with Ferrucio Busoni, who would be his primary composition teacher. During these student years, Weill worked industriously on many purely instrumental works and songs, mostly in Post-Romantic style, as well as his first attempts at opera. As the distinctively chaotic culture of Berlin between the wars began to thrive, Weill found his way into the Novembergruppe, an organization of progressive artists from different disciplines that included musicians such as Hanns Eisler and Stefan Wolpe. In this progressive environment, Weill found collaborators who would help mold his innovative vision of modern music theater, including Yvan Goll and Georg Kaiser (whose assistant, Lotte Lenya, became Weill's wife and a powerful force in his career). While Weill was working as a writer/critic for Der Deutsche Rundfunk, he glowingly reviewed a 1927 radio performance of Bertolt Brecht's Mann ist Mann. Brecht was so impressed by the review, and by the fact that a composer could have such insights into theater, that he invited Weill to dinner. Weill must have been further enticed when Brecht presented to him a lengthy published book of poetry with the title Bertolt Brechts Hauspostille (Bertolt Brecht's Household Breviarya reference to a work by Martin Luther). In a foldout appendix glued to the back lid of the book, notated melodies and lyrics for five songs, known as the Mahagonny Lieder, demonstrated Brecht's interest in putting words to music and evidenced unmistakable influence by cabaret poet and singer Frank Wedekind. In those days, Brecht carried a guitar with him wherever he went, belting out songs, which were often in pidgin English (one of Brecht's many prophecies was that a form of pidgin English would be the first world language). Some acquaintances even insist he was quite accomplished on the guitar. 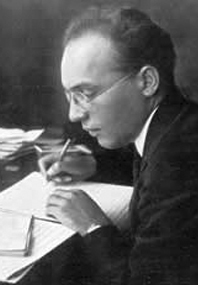 A young composer working for Brecht named Franz Servatius Bruinier (1905-1928) is credited with first writing out the melodies of the Mahagonny Lieder, and an extant recital program for a vocalist suggests he also arranged them for voice and piano, along with several other songs attributed to Weill/Brecht, including Seeräuber-Jenny (Pirate Jenny) and Surabaya-Jonny. Weill claimed he never considered these (or any other melodies presented to him by Brecht) when writing out his own melodies and arrangements, but these ur-melodies by Brecht or Brecht/Bruinier are definitely the seeds from which many of Weill's early theatrical songs evolved. The origin of the word Mahagonny is unclear: one possible source is a 1922 song by Leopold Krauss-Elka and O. A. Alberts, Komm nach Mahagonne!, which was made into a hit by the Norwegian crooner Henry Erichsen; or it could have also been inspired by the Biblical city of Magog. Mahagonny, as a run-amok town in Alaska, partly symbolizes Berlin during its hyperinflation of the 1920s, but draws influence from Jack London's stories and Charlie Chaplin's The Goldrush (1925). Weill added a sixth song to the Mahagonny Lieder, provided a stridently dissonant accompaniment while maintaining the cabaret feel, and created the first of the Brecht/Weill collaborations with the title Mahagonny Songspiel. The word Songspiel parodied the German tradition of Singspiel, replacing the word sing with the American word song. Mahagonny Songspiel was staged for the 1927 Donaueschingen Festival (held in Baden-Baden that year), which was organized by Paul Hindemith and emphasized new music theater. The relationship between Weill and Brecht was famously not a warm friendship, although Brecht frequently avoided overt friendly contact with collaborators (with some exceptions). Nonetheless, Brecht's influence on Weill must have been enormous, from his ideas on epic theatre (i.e., an anti-escapist approach to theater attributed to Brecht's friend Erwin Piscator that allowed the audience to see stagehands and the mechanics of theater while they functioned) to the prophecies of America's culture laden with unostentatious gangsters overtaking European culture. Later dubbed The New Objectivity (die neue Sachlichkeit), the overall theatrical approach emphasizes gesture by the actors/singers and served as a reaction against German Expressionism via realistic, non-distorted images (such as in newspapers). There is also a concerted attempt to put relevant social and political commentary into the productions, no matter how old or exotic the source material is. A successful revival in London of John Gay's 1728 The Beggar's Opera caught Brecht's eye, and he instructed his assistant, Elisabeth Hauptmann, to prepare a German translation of it. A Berlin actor named Ernst Josef Aufricht had recently acquired a theater (Theater am Schiffbauerdamm) and offered its première production to Brecht. Brecht agreed and proposed the German version of The Beggar's Opera, also insisting on discarding the original 18th-century songs and replacing them with new, original songs. From this simple idea, Weill set new lyrics by Brecht to new songs (one original song from The Beggar's Opera was retained), and they called the concoction Die Dreigroschenoper (now popularly translated as The Threepenny Opera, even though a Groschen is actually a dime). The overwhelming success of this 1928 production (with Lenya playing one of the minor roles) made celebrities out of Brecht and Weill. Unlike Mahagonny Songspiel, Weill's music in Die Dreigroschenoper did more than demonstrate influence by the hit songs (or Schlager) from America's then infamous Tin Pan Alley and jazz: it genuinely created a craze (referred to as Dreigroschenfieber or Threepenny fever). Although a simplified arrangement of The Alabama Song from Mahagonny Songspiel was published in sheet music form and promoted as if it could be a hit song (it would 40 years later), many songs from Die Dreigroschenoper became hits without much promotion shortly after they were performed, especially the opening number Die Moritat von Mackie Messer, which would become one of the biggest hit songs of the 20th-century after both Weill and Brecht had died. The next Brecht/Weill collaboration, Happy End, utilizes less music than Die Dreigroschenoper, but is stylistically similar. An attempt to expand the Mahagonny Lieder into a full-length opera, Der Aufsteig und Fall der Stadt Mahagonny (The Rise and Fall of the City of Mahagonny), met with many obstacles, including ongoing demonstrations by the Nazis. A radio cantata called Der Lindberghflug and a school opera in two versions based on Japanese Noh drama (Der Jasager/Der Neinsager) were collaborations on a smaller scale. Despite Weill's plunge into his own sophisticated version of popular music, he apparently still held on to ambitions of being a more conventional opera composer. While still in Berlin, he composed such an opera, Die Bürgschaft, working with Brecht's childhood friend and scenic designer Caspar Neher (with whose wife, Erika, Weill was having an open affair). Georg Kaiser's and Weill's Die Silbersee is more a musical, but Weill also considered it an opera. One month after its simultaneous opening in three different German cities in 1933, Weill decided to leave Germany for Paris with little more than a suitcase. In Paris, Weill collaborated again with Brecht in a ballet chanté (i.e., a ballet with singing) called Die sieben Todsünden (The Seven Deadly Sins), starring dancer Tilly Losch and Weill's then estranged wife Lenya. The production served as part of the first and only season of George Balanchine's short-lived troupe known as Les Ballets. The widely held myth that Weill's relationship with Brecht had by this time deteriorated beyond repair is not consistent with the evidence that they stayed in contact for the rest of Weill's life (Brecht outlived him by only six years). In fact, they would make another attempt to collaborate one evening in 1943 at Weill's house with Schweyk in the Second World War and The Good Woman of Setzuan. Weill arrived in New York City in 1935, expecting to only work on one gigantic pageant of Judaism with the title The Eternal Road. The enormous Meyer Weisgal production brought together a dream team of director Max Reinhardt, librettist Franz Werfel and Weill. Because of its huge scope, The Eternal Road met with many financial and production setbacks, and Weill had a chance to settle into New York and rub elbows with some of the most influential American theatrical talents of that time. By the time The Eternal Road began its limited run in 1937, Weill had already premièred on Broadway his first American collaboration, Johnny Johnson, with playwright Paul Green (produced by the Group Theatre, led by Cheryl Crawford, Lee Strasbourg, and Harold Clurman). His friendship with writer Maxwell Anderson (who would also become Weill's neighbor) led to Knickerbocker Holiday (1938), which included the hit September Song. A collaboration with Moss Hart and Ira Gershwin earned him a genuine Broadway hit with Lady in the Dark (1941), followed by another hit with Ogden Nash and S. J. Perelman, One Touch of Venus (1943), at a time when the most renowned Broadway musicals, such as Oklahoma! and South Pacific, were becoming standard fare. Some of the more successful late Weill productions included Street Scene (1947), Love Life (1948) and Lost in the Stars (1949). When Weill died of a heart ailment one month after his 50th birthday (3 April 1950), his legacy and estate went into the hands of Lenya, who continued to nurture his career up until her death in 1981. Unexpected prosperity came in 1954 with an English-language version in New York City of Brecht/Weill's The Threepenny Opera, with help (including a stylish translation) from composer Marc Blitzstein. This production distinguishes itself as one of a handful of productions that became the cornerstone of the phenomenon known as Off-Broadway. A few years later, Louis Armstrong made the song Mack the Knife into a hit single, followed by a version by Bobby Darrin (1959) that became one of the most famous Grammy-winning hits of all time. Many American television and movie stars, including Jerry Ohrbach, Bea Arthur, Jerry Stiller, and Ed Asner, appeared in this Off-Broadway production, which ran at the Theatre de Lys (today, the Lucille Lortel Theatre in Greenwich Village) for almost a decadeone of the longest running shows in New York City history. Some other cultural barrier crisscrossing addenda to Weill's career include the fact that Lenya starred as the villain Rosa Klebb in the James Bond film From Russia With Love (1963) and was no doubt the inspiration for the female villain Frau Farbissina in comedian Mike Myers's successful Austin Powers trilogy of movies (1997, 1999 and 2002). In 1967, The Doors recorded a simplified version of Brecht/Weill's Alabama Song which became a big hit, inspiring other rock stars to cover the song including David Bowie and Marilyn Manson. In many ways, Weill had just as much, if not more, influence on the second half of the 20th-century than the first. This influence is still widely taken for granted. Crossover and Its Confusion Xenophobia between European and American cultures inevitably produce oversimplified viewpoints of Weill's music, whether assessing it positively or negatively: the Germans (especially Berliners) tend to look upon his American career as less important; and many Americans (especially New Yorkers, such as author Foster Hirsch) insist his German career is less important than what he did on Broadway. In a similar way, the traditional rift between high and low culture (which in Germany is commonly specified as E-Kultur and U-Kultur) is illustrated, for instance, by opera purists looking down at Weill's work as selling out to popular culture, and pop culture purists often treating the notion of high culture altogether as some sort of malicious snobbery. Such oversimplifications suffer not only from myopia, but double-vision: a clichéd two-Weills approach to assessing his career is common. Included in this confusion is how to classify Weill's innovative theatrical works in light of the fact that universal definitions of opera and musical do not exist. Weill himself called Street Scene an American opera almost as a nuance to distinguish or elevate it. Michael Feingold, drama critic for The Village Voice, calls Weill the most influential composer of the [20th] century, and this goes beyond a theater critic's admiration of Weill's indispensable contribution to the Off-Broadway scene in New York. Feingold uses Weill to articulate the view of many pop culture enthusiasts that, in the 20th century, American pop culture became the heir of European classical music of the 18th and 19th centuries within a universal musical language that resonates with and within important historical events. More doctrinaire critiques, such as Virgil Thompson's, have dismissed Weill's work as dabbling in popular music, although Thompson typically mitigates this with guardedly positive statements about Weill's music. Weill's own composition teacher Ferruccio Busoni, despite their close friendship and mutual admiration, criticized Weill's work in music theater as a poor man's Giuseppe Verdi. Theodor Adorno dismissed Weill altogether as a mere tunesmith and arranger. Kim Kowalke, who has served as the President of the Kurt Weill Foundation since Lenya's death in 1981, strongly asserts that Weill's significance lies beyond his collaboration with Brecht. He further points out that all of Weill's works are some sort of hybrid, unrelated to one another. He points to Die Bürgschaft and Street Scenes as Weill's true legacy as an opera composer. In all these ways, assessing and reassessing Weill throughout the years produces many differing opinions. Perhaps the difficult task of fairly assessing Weill's career as a whole will never yield a definitive view. If the multifarious culture of the 20th-century requires such a versatile crossover artist, then perhaps Weill is a quintessential representative of this era. Undoubtedly, much of his versatility rested in his ability to adapt, something many of his fellow German émigrés could not do as well.